The list is by no means comprehensive, but rather just includes those journals I've found of good use recently and/or have web content helpful for research purposes (i.e. issue table of contents). The dominating presence of Trans-Mississippi and Western journals simply reflects my own personal research interests. The list will be updated periodically as more come to mind for inclusion. BTW, G.E. Rule (of the great Civil War St. Louis website) has kindly searched through Missouri Historical Review and listed for us all the Civil War related articles from 1906-2002. See here. 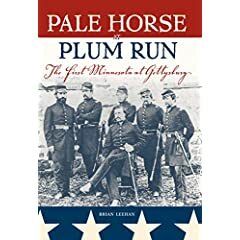 Leehan: "Pale Horse at Plum Run"
Late on a hot, dusty July day in 1863, the First Minnesota Volunteer Infantry plunged down into a rock-strewn ravine south of Gettysburg and passed into legend. James Longstreet’s ferocious assault on the Federal left flank on July 2nd had just finished destroying Dan Sickles’ III Corps along with the reinforcements sent down from Winfield Scott Hancock’s II Corps. Consequently, a large gap appeared in the center of the Union line and opposite this hole stormed the Alabamians of Cadmus Wilcox’s brigade. Faced with disaster, Hancock grabbed the only infantrymen immediately available, the First Minnesota, and ordered them into the maelstrom. Their sacrifice is re-examined in exceptional detail in a compelling new book by Brian Leehan. Pale Horse at Plum Run is a fast-paced book that comprehensively recounts the actions of the First Minnesota at Gettysburg. Though the famous charge on July 2nd rightly forms the centerpiece of the book, a stirring account of the regiment’s participation in the repulse of Pickett’s Charge on the next day is also included. The research is exhaustive and the detail extraordinary. Furthermore, the author’s approach to the subject is careful and refreshingly evenhanded. For instance, Leehan consistently avoids hyperbole when discussing the heroics of the First Minnesota on the 2nd, giving the units flanking the regiment (the 19th Maine and Willard’s brigade of New Yorkers) their proper due. Wading through a wealth of material, Leehan uses sound reasoning and meticulous research to reinterpret the many myths surrounding the charge—from the numbers engaged and lost to the results of the charge and the circumstances of Hancock’s order. The narrative is augmented throughout with the personal letters and reminiscences of the participants, though very few are by members of Wilcox’s brigade. An opportunity to provide valuable perspective from the opposing side is unfortunately lost here (especially since many details of the charge are deeply shrouded in myth and exaggeration). Several appendices add even more value to the book. Of perhaps the greatest interest to the general reader is the essay discussing the role of mythmaking in the understanding and remembrance of battles. Articles providing a comprehensive listing of casualties and analysis of numbers engaged are included as well. Finally, even the most casual reader is urged to examine the book’s unusually expansive endnotes, which are full of hidden gems. Brian Leehan has created an important work that significantly increases our understanding of the role of the First Minnesota in the battle of Gettysburg. This book is highly recommended. "the white face turned upward, the hands thrown out and clutched full of grass, the clothing deranged, the long dark hair in tangles and full of clotted blood. The greater part of the forehead was torn away and from the jagged hole the brain protruded, overflowing the temple, a frothy mass of gray, crowned with clusters of crimson bubbles -- the work of a shell." is a particularly memorable, and awful, example of this. There is no heroic death or noble sacrifice, just an abrupt and often painful end to a promising life. The survivors that are willing to think about it are left to wonder if the cost was worth the gain, if there was any. Bierce has an abused subordinate's principled disdain for the unworthy man placed in a position of great responsibility. The big men in his short stories -- General Cameron in "One Kind Of Officer", 'the general' in "The Affair at Coulter's Notch", and the 'Governor' in "An Affair of Outposts" -- are uniformly callous in their manipulation of the lives of the men beneath them. Of course the twist ending is ruined for anyone who's seen the wonderful Twilight Zone episode, but my particular favorite will always be "An Occurrence at Owl Creek Bridge". Several of Bierce's stories employ intentional ambiguity, but the unusual (and perhaps experimental for the period?) structure of "Occurrence" and its truly startling conclusion are delightful. As a reader generally uninterested in Civil War fiction, I was enthralled with Bierce's storytelling. That the tales sprouted from the mind of an actual Civil War veteran only enhances the authenticity of the imagery and the reader's consideration of the author's brutal examination of so many of the conflict's themes. As many of you probably already know, the Blue and Gray Education Society has published a number of monographs over the past few years (did they stop doing this?...the latest is from early 2005). I'm not a BGES member, nor have I read any of these so I can't comment on them individually, but many of the titles at least sound enticing and they appear to be written by a range of accomplished authors. Scroll down through the Monograph Authors section. It appears Warren Grabau is working on a book about the Union navy. Also, having read a number of articles this past year dealing with the area described below, I was intrigued by the last person on the list, Stephen G. Smith, and his dissertation research which "concentrates on the South Branch Valley of the Potomac during the Civil War". Marching with the First Nebraska: A Civil War Diary by August Scherneckau; Edited by James E. Potter, Edith Robbins; Translated by Edith Robbins (University of Oklahoma Press) promises to be another valuable addition to a growing volume of published primary accounts written by Trans-Mississippi soldiers. "August Scherneckau’s diary is the most important firsthand account of the Civil War by a Nebraska soldier that has yet come to light. A German immigrant, Scherneckau served with the First Nebraska Volunteers from 1862 through 1865. Depicting the unit’s service in Missouri, Arkansas, and Nebraska Territory, he offers detail, insight, and literary quality matched by few other accounts of the Civil War in the West. His observations provide new perspective on campaigns, military strategy, leadership, politics, ethnicity, emancipation, and a host of other topics." This is a nice start, but someday I would love to see the publication of a full regimental history of the 1st Nebraska. (1) James Denny and John Bradbury. Where the Civil War Began: Missouri Prior to and Through 1861. Illustrations, softcover, 144pp. $29.95. February 2007. (2) Doris Land Mueller. M. Jeff Thompson: Missouri’s Swamp Fox of the Confederacy. Illustrations, bibliography, softcover, 144pp. $14.95. March 2007. From the descriptions and the length (only 144 pages each), it would be hard to imagine them as much more than overviews (with hopefully some new insights). I have been told the Denny and Bradford manuscript is quite good, and perhaps projected to be part of a series. M. Jeff Thompson is certainly a fascinating character. A full-length biography of the "Swamp Fox" doesn't exist yet, but Jay Monaghan wrote a bio of similar length to the Mueller book above for Broadfoot titled Swamp Fox of the Confederacy: The life and military services of M. Jeff Thompson. It should be noted that Mueller is a children's book author and her book will be part of UM Press's Missouri Heritage Readers Series, "intended primarily for adult new readers, these books will also be invaluable to readers of all ages interested in the cultural and social history of Missouri". The academic press blogs, at least the ones I've glanced through, don't offer much in the way of Civil War content from their contributors or authors, but I came across an interesting post at the Oxford UP site. Glenn LaFantasie, author of recent books dealing with the Little Round Top fight and Confederate Colonel William C. Oates, comments on reviews and reviewers, most particularly about a bafflingly negative one from Publishers Weekly (all the worse that it's anonymous). Hess, Hatcher, Piston & Shea: "Wilson's Creek, Pea Ridge, and Prairie Grove: A Battlefield Guide"
I applaud University of Nebraska Press for taking a timeout from 'the usual suspects' and choosing to publish a tour guide for three crucial Trans-Mississippi battles, and for matching author with subject so well (Hess for Pea Ridge, Piston and Hatcher for Wilson's Creek, and Shea for Prairie Grove). Also, the decision to include a driving tour of the Wire Road was inspired. The Wire or Telegraph Road played a critical role in all of the dramas played out across the Ozark plateau in Missouri and Arkansas. By no means is it simple to trace, and this guide gives the reader the ability to follow it as closely as possible from Springfield, Missouri all the way south to Ft. Smith, Arkansas. Aiding continuity, each tour is structured along similar lines, with each tour stop organized into the self-explanatory Directions, Orientation, What Happened, Analysis, and an optional Vignette. It's practical, and very effective. The descriptions are detailed enough to satisfy the most demanding students of Civil War battles, yet will not bog down the average nature tramper. As another nice touch, tours to places peripheral to the main battles but part of the overall campaigns are included, several of which I didn't know were marked and/or still in recognizable form. I wish I had this book the last time I visited the area. The guides' numerous maps deserve special mention. Their level of detail is extraordinary. Elevation contours and other relevant terrain features (woods, orchards, streams, buildings, fencelines, both modern and period roads, trails--it's all in there). The majority of military movements are traced on the maps at regimental scale, similar to that found within the best of modern tactical battle studies. The only complaint I have is the up-close Pea Ridge maps do not have the actual numbered tour stop locations placed on them. However, this is only a minor distraction. They are easy enough to find following the Directions and Orientation sections associated with each stop, but a visual marker would have helped nonetheless. In general, these markers are prominently displayed in both the campaign overview map and the smaller scale maps associated with each stop. In addition to the fine maps, a number of well chosen photographs and illustrations are included, many of which are new to my viewing. Extras placed in the rear of the book include serviceable orders-of-battle for each campaign and a very helpful guide to further reading with commentary on sources. If this volume is an indication of the quality of all the books in the This Hallowed Ground Series, then it is clear to me this series should be considered the class of Civil War battlefield tour guides. For intellectual depth that does not sacrifice ease and practicality of use in the field, it would be difficult to imagine this guide being superseded any time soon. Highly recommended. Wow, three over a year period from the same press. It'll be a while yet before we see Steven Mayeux's Earthen Walls, Iron Men: Fort DeRussy, Louisiana, and the Defense of Red River (University of Tennessee Press, Aug./Sept. 2007), but it's great to see more interesting Red River books coming out. There are few (if any, really) specialized works published for this campaign and so many general histories. 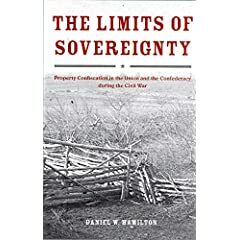 Rather than view wartime confiscation in isolation, I am happy to see the book plans to trace the evolution of property rights from founding through Reconstruction. Owens: "Hier Snackt Wi Plattdütsch"
The 1861 events in Missouri are my most abiding Civil War interest. Recently, a helpful fellow on the Missouri in the Civil War board directed my attention toward a book from Robert L. Owens titled Hier Snackt Wi Plattdütsch (trans. - Here we speak low German). Educated only in high German, I was intrigued by the language and dialect differences among the various lowland areas of German speaking Europe. Sadly, my ILL period was far too short to properly appreciate the entire book. Instead I focused on the June 19, 1861 Battle of Cole Camp (Chapter 16). The two sides were evenly matched at around 3-400 militamen per side, but the southern forces were able to achieve tactical surprise and drove off the Unionist home guards after a vicious little 20 minute fight. Losses were heavy, with the Union force suffering at least 32 killed. The victory opened the retreat route for the forces of Governor Jackson, previously routed at Boonville. With previous works, Cole Camp is mentioned in passing or at most a sentence or two is dedicated to it. However, Mr. Owens seems to have delved deeper into the subject than anyone else and he's has done a marvelous job researching and presenting a detailed blow-by-blow account of this small battle for the reader. The tactical history is bracketed by fine summaries of both the events leading up to the battle and its aftermath. Footnoted and supported by seven fine maps, Owens' work is also enhanced by his decision to include a ream of additional detail in the appendices; including a campaign and battle timeline, geographical and meteorological data, and a casualty list. The author also discusses his management of the source material. I would recommend this fascinating book to anyone interested in the German culture and settlement of Missouri and in the Cole Camp fight (Chapter 17 also briefly discusses the effects of the later guerilla war on the civilian population). On the heels of his latest book Through the Howling Wilderness, Gary Joiner has another project with University of Tennessee Press planned for publication next year. This time it's an edited volume for the Voices of the Civil War series titled Little to Eat and Thin Mud to Drink : Letters, Diaries, and Memoirs from the Red River Campaigns, 1863–1864 (Mr. Joiner always picks such great titles!). On another note, I see UT Press is having another 75% off sale on almost 200 titles, just in time for Christmas. Take a look. Not too many Civil War titles, though. From Conciliation to Conquest: The Sack of Athens & the Court-Martial of Colonel John B. Turchin (University of Alabama Press) by George Bradley and Richard Dahlen. "...the questions about underlying policy presented by the times to those then in charge remain with us. Will we liberate, occupy, conquer, or punish? Why have the people volunteered? What happens when an anticipated liberation becomes an occupation of an area inhabited by a mixture of welcoming and hostile citizens? How should an army of occupation behave? What can we reasonably expect of volunteers in uniform, given due consideration of their reasons for enlisting, their training, and the level of leadership they have? Knowing what we can or cannot expect of them, is it proper, advantageous, or disadvantageous to deploy them in the troubled territory?" Wilson's Creek, Pea Ridge, and Prairie Grove: A Battlefield Guide, with a Section on Wire Road (University of Nebraska Press) by Earl J. Hess, Richard W. Hatcher III, William Garrett Piston, and William L. Shea. This is the first book length guide for these battles, and the organization and maps look first rate. This series is shaping up to be the best for providing value and practicality. Lincolnites and Rebels: A Divided Town in the American Civil War (Oxford University Press) by Robert Tracy McKenzie. My Pickens ancestors were very active East Tennessee unionists, so I have an especially focused interest in this divided region. Lyftogt: "Iowa's Forgotten General: Matthew Mark Trumbull"
Active in the Chartist movement, Matthew M. Trumbull was forced to immigrate from England to the U.S. as a young man. When the Civil War came, Trumbull, by then a prominent NE Iowa citizen, was commissioned as a captain in the 3rd Iowa infantry. With Iowa's Forgotten General, Kenneth L. Lyftogt has provided us with a brief but informative military biography of Trumbull. I found this book of interest, mainly for Trumbull's military activities in the historiographically neglected northern half of Missouri in 1861. The author writes of the fights at Shelbina and Blue Mills Landing in some detail. Additionally, the importance of holding and protecting the Hannibal and St. Joseph Railroad is not often recognized in other works dealing with the first year of the war in Missouri. Leaving the Trans-Mississippi theater, the 3rd Iowa's exploits at Shiloh and the Hatchie (Davis Bridge) are also covered, although I would quibble somewhat with Lyftogt's account of the latter. The author also seems to have an unusually (and perhaps uniquely) high opinion of the generalship of Stephen Hurlbut. Later on in the war, and in poor health, Trumbull resigned his commission, but recovered soon after to recruited and lead the 9th Iowa Cavalry, which to his disappointment was relegated mainly to occupation duties for the duration. Trumbull had an active postwar career as well, gaining prominence as a socialist activist in Chicago. This slim but worthwhile volume will probably be of most interest to students of the Civil War in Missouri and Arkansas--and Iowa's prominent role in it. The author writes well and his subject is certainly deserving of recognition. Here. I am glad they added this feature to the new website. The previous index only listed the feature article. Dimitri's post about the very old (well, old as in 1980s) computer war/strategy game No Greater Glory brought back memories. I actually downloaded and played "No Greater Glory" again a couple years ago. You either have to use a really antiquated computer or tinker with an emulator. Hard to believe we thought those graphics were okay at one time. Those SSI days were a bit of a golden age. I'm not sure I trust the figures, but I read somewhere that it wasn't uncommon for SSI titles to sell 50,000 copies each. 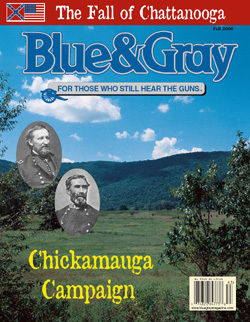 I recently finished the current issue of Blue & Gray and its impressive feature article by William Glenn Robertson. I haven't read much about the Chickamauga campaign beyond the magazine articles that frequently pop up and the books by Cozzens and Tucker, but I must say Robertson's operational history of the opening moves of Chickamauga campaign (the crossing of the Tennessee River below Chattanooga) is the clearest and most detailed I've come across. The day by day, full page operational maps were also crucially helpful (B&G rarely skimps on these--but the maps in this issue were exceptionally good). I wasn't aware that Robertson was considered "the man" when it comes to Chickamauga. His focused writing and tight organization seemingly crams a small book's worth of information into an article. I can't wait for the other two planned issues. In the book review section, it is mentioned that Richard McMurry is at work on a book about Joseph E. Johnston. No details about what its focus might be. B&G is in the middle of giving its website a makeover, presumably adding more features.